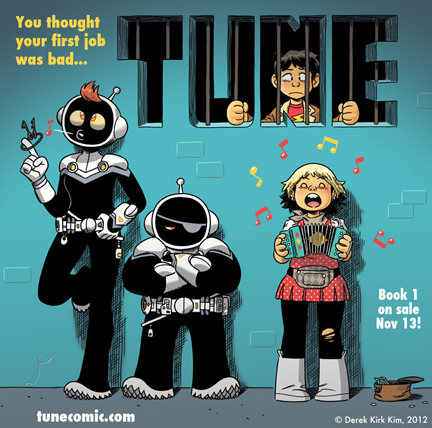 "TUNE: Vanishing Point" by Derek Kirk Kim reminds me a lot of Scott Pilgrim. It has the same retro feel to it. It's the story of an illustrator named Andy who dropped out of college. The book starts in a college end of the year party. It's made clear that he has a crush on a girl named Yumi. Yumi happens to be one of Andy's best friends. After Andy dropped out, his parents gave him a week to find an "art" job. The only people who would accept him wouldn't even pay him. At the end of the week Andy was given a lecture from his dad about how he wasn't special, he wasn't going to be famous and he wasn't destined for great things. I know, what a great dad. Andy is forced to go into the magical world of unemployment. He looks for work in offices, coffee shops, newspapers and fast food restaurants. None of them hire him. One day while Andy sulks, he notices he is being drawn by Yumi. Once she finishes, she lets Andy look at a few pages in the front of her sketchbook. She doesn't let him look in the back because that's her journal. In a few minutes, she runs off to class, accidentally forgetting her sketchbook. Andy decides that no harm could come from reading a few more pages. Of course he ends up reading the whole book. Towards the end of the sketchbook, Andy learns that Yumi is just as in love with him as he is with her. In an hour he is at a job interview with aliens. I wont spoil everything, but lets just say Andy finds employment. The artwork in Vanishing Point is not the biggest whoop, but the thing I like about it is how the aliens are drawn. They are purposefully made to look like Marvin the Martian. Everything else is pretty normal. I would not suggest this book for immature audiences. There is a bit of strong language. If you can handle that, you can handle this. Vanishing Point came out recently so there is no sequel yet. I'm pretty sure that there will be another TUNE in the future. I would give Vanishing Point 3.5 alien abductions out of 5. Thanks for the recommendation! I'm gonna track down a copy for my son, Joe. He's 11. I bet he'd like it. Keep 'em coming! Excellent review. Judging from the cover (I know, we're not supposed to do that), the rendering of the aliens does seem pretty cool. I want to know what's in that notebook, so I'm going to read this novel! What do you think? How would you feel if someone read your journal? I realize this is a slightly odd question to ask a blogger! Keep up the good work. We are always looking for good books. Not sure I find it believable that Yumi would leave her sketchbook behind, allowing Andy to find it, but the idea that he immediately gets an interview with aliens and finds work...that make me want to check the book out. Andy's father is not my favorite guy in the world right now. I had not heard about this book, so thanks for the review! Thanks for the great review, Milo. It always impresses me that your blog posts include a description of the artwork and your opinion about if it fits with the story. I'm not a visual artist, so it seems like a hard thing talk about. This book seems like something Nick would be into -- I like that the job market on Earth is so rough that people are turning to aliens for work opportunities! What a great blog! I just went to the exhibit with Derek Kirk Kim in Chinatown, I hope you had a chance to see it!